Every bar has a soul- and that soul evolves around the primary clientele that the bar wishes to entertain. 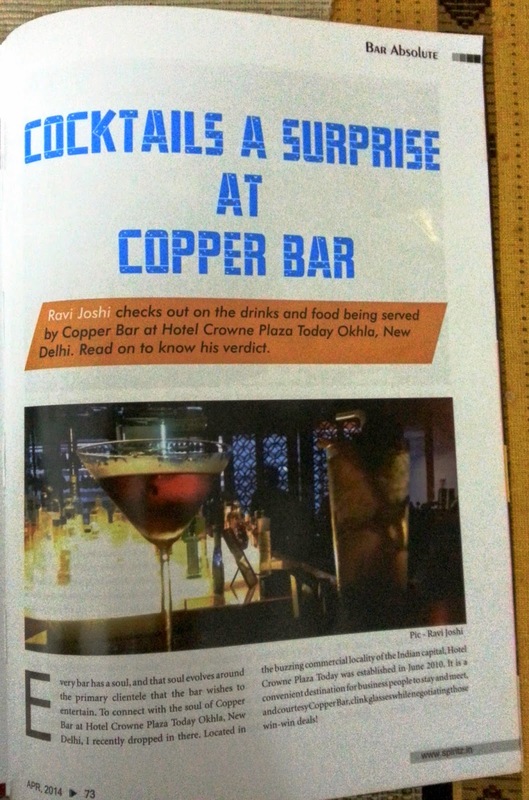 To connect with the soul of Copper bar at Hotel Crowne Plaza Today Okhla, I recently dropped in there. Located in the buzzing commercial locality of the Indian capital, Hotel Crowne Plaza Today was established in June 2010. It is a convenient destination for business people to stay and meet, and courtesy the Copper Bar, to clink glasses while negotiating those win-win deals! Though the bar mostly caters to business visitors, others are welcome too. To emphasize this aspect, it has an adjoining alfresco area replete with an exclusive neon lit bar counter, stools, a giant screen with projection system and an informal seating arrangement. With the IPL season approaching, the ongoing muster at the place was quite palpable. The main bar is conveniently situated near the lobby and hard to miss. The bar proudly displays its “Meet and Eat” USP wherein one could order bar food as also requisition common office facilities such as photocopying, fax, scanning, CD copying etc at the flick of la carte. The overall ambience is warm and welcoming with abundant use of wood and copper highlights. Thanks to a massive floor area and various configurations of seating arrangements, finding a place of preference is not a problem. The inter se distances between seating clusters ensure a good level of privacy without having to miss the bonhomie around. The bar island is surrounded with temperature controlled wine ‘caves’ (French for cellar and pronounced kaav) that also act as show-windows. A separate kitchen island complements the bar to animate the ambience. The liquid glitterati had a predominance of Single Malts and other straight drinks. As I strained to locate the cocktails within the menu, Rohit Sharma, the beverages manager of the hotel explained- “our primary clientele is business people who largely prefer straight-up drinks, hence we have excluded cocktails from the menu – but these could definitely be ordered by the clients”. Not fully convinced, I decided to order an “Old Fashioned” to find the proof in the pudding. The litmus test turned out to be affirmative, encouraging me to venture further. Old Fashioned: Bourbon whiskey, Angostura bitters and sugar with lots of ice and garnished with an orange peel. Verdict: Outstandingly prepared to text book perfection. I didn’t feel like leaving the cocktail after a few sips but professional compulsions dictated otherwise. Rob Roy: Blended scotch whisky, sweet vermouth and Angostura bitters with a lemon spiral garnish. Verdict: The proportion of all ingredients being perfect, the drink was delectable. However, the temperature was slightly wanting. The James Bond-ian diktat of “shaken, not stirred’ could have worked here. Enjoyable, nevertheless. Mai Tai: Dark rum, white rum, pineapple juice, orange juice, Cointreau, lemon juice. Verdict: This was a slightly tweaked Mai Tai with the absence of Amaretto (bitter almond flavored liqueur) and presence of some sugar granules for a crunchy feel. Those who like sweeter styled drinks would love it. But for a person like me, the lesser sweet version having the nuttiness of amaretto retains the mojo. Margarita Chronicles: Tequila, lemon juice, triple sec, bell peppers. Verdict: A signature preparation of the bar, this was a superbly innovative drink harnessing the fresh spiciness of bell peppers and a rainbow effect all through the highball glass. An interesting and productive twist to the classic margarita that could well be chronicled – true to its name. Golden Fried Prawns with Sweet Chilli Sauce: Delicately flavoured prawns in a crispy coating. The mild flavors and a rich unctuousness made them good to go with any drink. The sweet chilli sauce married well with the hint of sweetness in the prawns and spiciness of the flavouring. Lamb Chapli Kabab with Mint Sauce: Succulent, flavourful and coarsely textured kababs that were quite filling. The freshness of ingredients was noticeable with bell peppers and coriander leading from the front. First bite and I was tempted to ask for a robust red wine. Of course the cocktails did great too! Falafel and Pita bread with Tahina dip: An innovatively presented bite sized version of the popular Lebanese dish. Well suited for scalable eating without disturbing the remaining portion- hence well suited to sharing sans overeating. Paneer ke Sooley with Mint Sauce: This dish of pan seared soft cottage cheese chunks with mint stuffing had a rich and creamy texture resultant of its marinade of hung curd and fresh cream. Quite filling and satiating. The wine I requested having arrived (a Chilean Merlot), I had an opportunity to see the level of wine service which was quite good with pristine glassware, correct wine temperature and serving etiquette. Overall, the bar turned out to be a pleasant experience and well entrenched in its business orientation. I’m quite positive that the Grands Crus wines on its list will roll pretty fast! Timings: 11 am to 1 am.